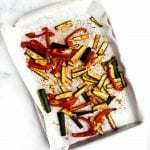 Oven Roasted Fajita Veggies are simple to make, packed with flavor, and an easy way to add extra vegetables to meal time. Toss the chopped vegetables in the olive oil and taco seasoning until evenly coated. Bake at 400 degrees for 25-40 minutes, or until the vegetables are soft and begin to caramelize on the edges. This recipe has not been tested for FODMAP content, but all ingredients are used in Low FODMAP amounts according to the Monash University App.